Sometimes street names tell stories. The names in Portland's Alphabet District are especially good at revealing the history of Northwest Portland. 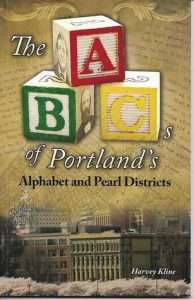 Take a walk, or a streetcar ride, around the Alphabet and Pearl Districts. With this book in hand, learn about the lives of the people whose names are on the street signs. Find out who gave Portland its name, read about the ship captains who shaped our city, and discover how some of these names found their way into The Simpsons.